US engineering firm Bechtel will manage construction of the proposed Wylfa Newydd nuclear power plant in Wales under a contract signed with Hitachi's UK subsidiary Horizon Nuclear Power. The announcement that Bechtel has been appointed project management contractor comes just days after press reports claiming the company had withdrawn from the Wylfa Newydd project. Both Bechtel and Horizon had described those reports as "categorically untrue". Horizon said, "The company will sit at the heart of the Wylfa Newydd project organisation, leading the contractual and commercial interface with suppliers on behalf of Horizon." It added, "The embedding of Bechtel within Horizon will mirror the kind of client/contractor relationship that has been successful in delivering the previous four ABWR nuclear reactors on time and on budget". Horizon announced in May 2016 it had appointed a joint venture responsible for construction of the Wylfa Newydd plant. The company - Menter Newydd - is a joint venture of Hitachi Nuclear Energy Europe, Bechtel Management Company and JGC Corporation (UK). Hitachi Nuclear Energy Europe is a wholly-owned subsidiary of Japan's Hitachi Ltd, while JGC New Energy UK Limited is a UK-registered 100% subsidiary of Japanese engineering firm JGC Corporation. 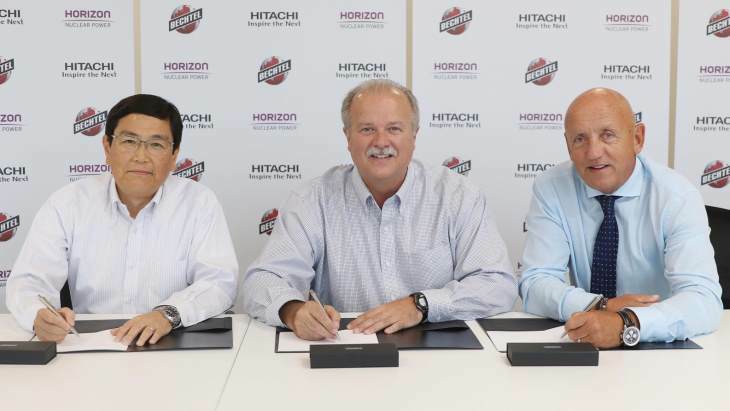 Horizon has also announced that it has signed further contracts with Hitachi Nuclear Energy Europe and JGC New Energy UK Limited. Under these contracts, the two companies will continue to provide support during the project's development stage. Hitachi Nuclear Energy Europe will supply the UK Advanced Boiling Water Reactors (ABWRs) for Wylfa Newydd, acting as architect engineer for the project. JGC will continue to provide a range of specialist services around the balance-of-plant - the other components and systems required for power generation beyond the nuclear island. "Issue of these contracts follows two years of excellent progress made by Hitachi, Bechtel and JGC, supporting the project development through their work in the Menter Newydd joint venture," Horizon said. "The contracting structure has now evolved in line with the next phase of the project as it moves into the pre-construction stage." Horizon CEO Duncan Hawthorne said, "These world-leading companies bring a wealth of nuclear, engineering and construction expertise to complement our growing organisation and will help us replicate the cost and schedule successes of the previous four ABWR reactors." He added, "The UK still needs reliable nuclear power to help transform our energy mix, and we are gearing up to deliver that. Our first power station will be cheaper than what has gone before and after that, with smart financing, supply chain learnings and no need for first time overheads, future project costs will fall further still." Barbara Rusinko, President, Nuclear, Security and Environmental at Bechtel, said: "We've been part of the Horizon family for several years, and it's been a pleasure to work alongside the company as it has evolved through its development phase. We look forward to continuing to bring our expertise to the construction of the UK's next new nuclear power station at Wylfa Newydd in our new role as Project Management Contractor." The ABWR design was developed jointly by GE, Hitachi and Toshiba, prior to the merger of GE and Hitachi, and is derived from GE's BWR concept. Four units - Kashiwazaki-Kariwa units 6 and 7, Hamaoka 5 and Shika 2 - have been built and operated commercially in Japan. ABWRs are now offered in slightly different versions by GE-Hitachi, Hitachi-GE and Toshiba. Established in 2009 and acquired by Hitachi in November 2012, Horizon aims to provide at least 5.4 GWe of new capacity across two sites - Wylfa Newydd, which is on the Isle of Anglesey, and Oldbury-on-Severn, in South Gloucestershire - by deploying Hitachi-GE UK ABWRs. In June, Hitachi and the UK government announced they had entered negotiations on public investment in the proposed Wylfa Newydd project. Hitachi plans to make a final investment decision on the Wylfa Newydd project next year and to start operation of the first unit in the first half of the 2020s.